FLOORING/PADDING – We recommend (not required) that a piece of cardboard be placed in the bottom of the crate and then covered with lots of shredded paper to about 1/3rd full. This provides cushion as well as a consistently dry bed for the pets. If you choose to send a regular dog bed, please be advised that is must lie flat in the crate (no high sided beds due to security). If your pet is a “paper eater” do not use the shredded paper. VENTILATION – Crates must have ventilation on all four sides – most all airline approved crates have ventilation on each side so if you purchase a crate without vent holes on the back, ventilation holes must be drilled on the back. CRATE LABELING – Two red & white arrow labels should be placed on the RIGHT FRONT & LEFT REAR corners of the crate, and the yellow Live Animals on each UPPER side with the arrows pointing upward as well as one on the UPPER back of the crate (not pictured). Red & White identification & food & water label (not pictured) should be placed on the TOP of the crate, just above the door. Use additional sticky tape if necessary. The airline may place other signage on your crate. 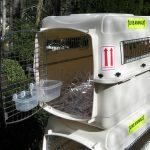 CRATE SIZE & SPECIFICATION – Pets must be able to stand up, turn around comfortably and MUST have at least 3 inches above the top of the head when standing erect. Crates must be hard case, non-collapsible, solid top and bottom (no opening on top) and without wheels. We highly recommend that the crates have screws to hold the top and bottom (see photo), versus snap type handles on the side. Whenever possible crates should have handles for carrying. Be sure your pet has a Minimum of 3” above the top of the head when standing upright and be sure the pet is not forced to curl the front legs to fit in the crate or your shipment may be refused. LEASH AND COLLAR (if applicable) – Take a zip lock baggie and a leash and collar for your pet, it will be taped to the top of the crate by cargo staff.